We’re in a celebratory mood over at The Golovine HQ. This post marks our first major milestone – our 100th post to have been published. The occasion presents the ideal opportunity for us, The Golovine team, to thank all of you who continue to support us by contributing material to the Blog and for reading it. But it also seems like the opportune moment to give ourselves a little pat on the back by casting an eye over the Stats, to see what we’ve achieved over the year and a bit since The Golovine was launched. 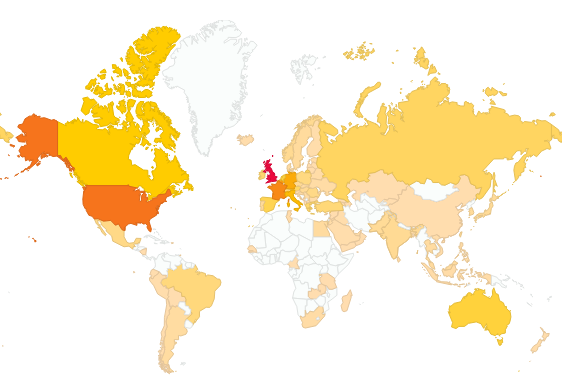 Back then, we had a pretty strong readership, unsurprisingly, in the UK. 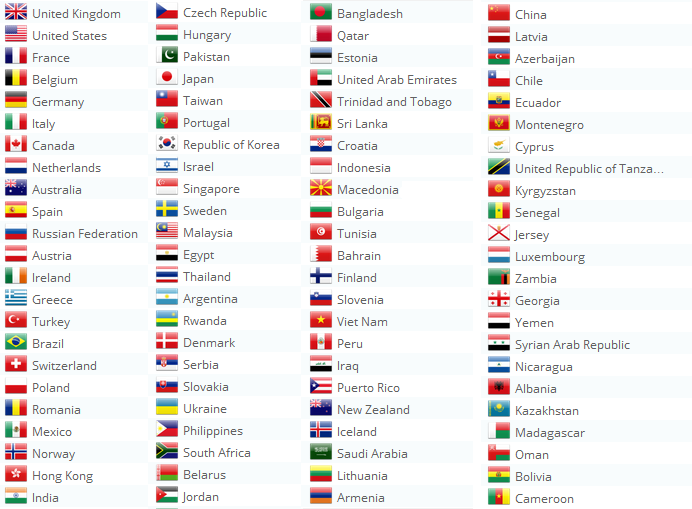 But we did also have a smattering of viewers in: France, the US, Belgium, Netherlands, Italy, Canada, Turkey, Taiwan, Spain, Hong Kong, Slovenia, Mexico, Switzerland, Australia, the Philippines, Iceland, Japan, Brazil, Bolivia, Germany, Hungary, India and China.
. . . pretty good . 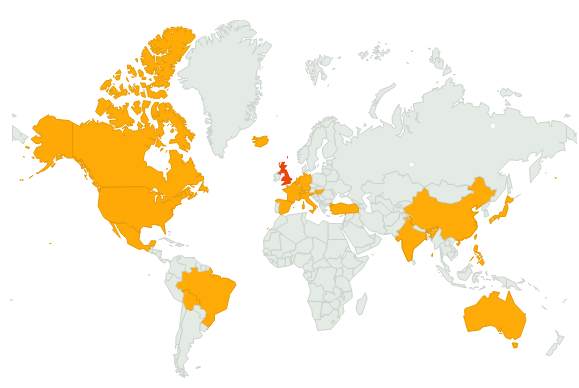 . .
To date, a big chunk of our viewers are still domestic (note the blood orange colour of the UK on the map), but we have also had hundreds of hits from readers in the US, France, Belgium, Germany, Italy and Canada (the darker oranges). … phew! We’re pretty chuffed with that. The best month on record was November 2013, when we had 1,285 views. Our best day on record also occurred during that month, on Friday 22nd November. That day we’d published 2nd year undergraduate Maysie Chandler’s post about designing costumes for the University production of Spring Awakening. Maysie’s post attracted over 200 views that day alone – well done Maysie! 3) Five Paintings, Ten Minutes Each = 300 Years of Art History! 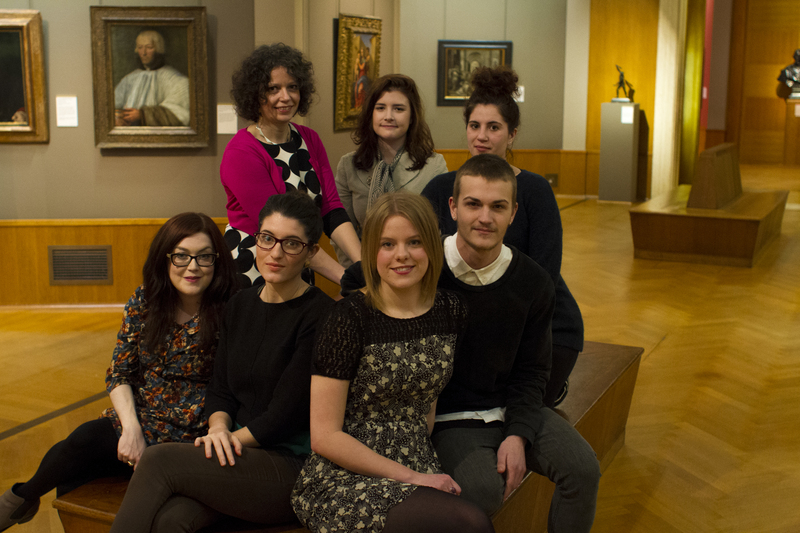 5) 35 days, 4 libraries, c.180 call slips, 6 museums, 3 lovely Fellows…. Yale, it was a blast! 9) Second year student Maysie Chandler turns her hand to costume designing for an upcoming University production . . . In short, we’ve come a long way since the Summer of 2012 when a couple of us sat down to have a chat about the idea of setting up a departmental Blog, and joked that we should call it “The Golovine” as a play on “we heard it on the (Golo)vine” and taking inspiration from the Barber’s Institute’s much-loved Portrait of Countess Golovine by Elisabeth Vigée-Lebrun. Turns out, though, that plenty of you out there have since heard lots from us on The Golovine . . . Here’s to the next 100 posts . . .